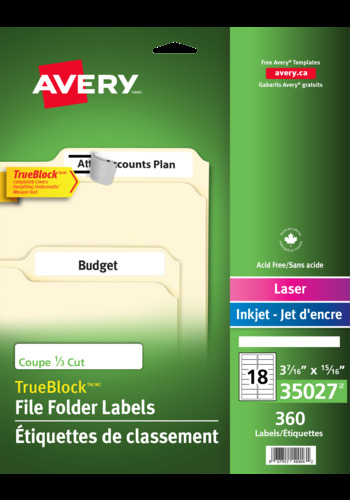 with TrueBlock™ Technology for Laser and Inkjet Printers, 3-7/16" x 15/16"
Easily organize and quickly identify important file folders with Avery® Filing Labels with Trueblock™. With these Extra-Large File Folder Labels with TrueBlock™ Technology, the answer's right in front of you. Each label has plenty of room for information, so you won't have to look inside files to find the one you need. Easily organize and quickly identify important file folders with Avery® Filing Labels with Trueblock™. With these Extra-Large File Folder Labels with TrueBlock™ Technology, the answer's right in front of you. Each label has plenty of room for information, so you won't have to look inside files to find the one you need. With Avery's patented TrueBlock™ Technology that is guaranteed to completely block everything underneath, you'll be able to reuse folders with old markings and labels. Create and print customized labels with your laser or inkjet printer using free templates from Avery® Design and Print Online software. The permanent adhesive ensure labels will stay put and will make your folders look great. Labels that are practical, easy and fast - now you've got it all covered. Label Size 3-7/16" x 15/16"